Beautifully engraved certificate from the Joliet and Northern Indiana Railroad Company issued in 1892. This item has been hand signed by the Company’s President, Cornelius Vanderbilt II and Secretary, and is over 119 years old. Punched cancelled. The certificate was issued to Edward Handley Warner of Leicester, England and endorsed by him on the verso. This also has a letter attached issued and signed by Samuel Steads Partridge (with red seal) who was the the United States Consular Agent in Leicestar, England. Cornelius Vanderbilt II (November 27, 1843 – September 12, 1899) was an American socialite, heir, businessman, and a member of the prominent United States Vanderbilt family. He was the favorite grandson of Cornelius Vanderbilt, who left him $5 million, and the eldest son of William Henry Vanderbilt, who left him close to $70 million. In his turn he succeeded them as head of the New York Central and related railroad lines in 1885. He had a reputation as something of a workaholic, though a stroke in 1896 compelled him to reduce his active business involvement. In 1867 he married Alice Claypoole Gwynne (1845–1934) whom he met at St. Bartholomew's Episcopal Church where both taught Sunday School. Their eldest son William Henry Vanderbilt II (1870–1892) died of typhoid fever while a junior at Yale University, and Cornelius endowed a large dormitory there. He disinherited his second son Cornelius Vanderbilt III (1873–1942) for marrying without his approval. Third son Alfred Gwynne Vanderbilt (1877–1915) went down with the RMS Lusitania. His remaining son was Reginald Claypoole Vanderbilt (1880–1925), the father of Gloria Vanderbilt and grandfather of television news anchor Anderson Cooper. His daughters were Gertrude Vanderbilt Whitney (1875–1942) and Countess Gladys Vanderbilt Széchenyi (1886–1965). The fabulous Fifth Avenue mansions he, his brothers, and his sons lived in have been demolished, but the Newport, Rhode Island vacation home he built, The Breakers, still stands as a memory of the lifestyle of Cornelius Vanderbilt II. Vanderbilt was active in numerous organizations including the YMCA, Red Cross, Salvation Army, Trinity Church, St. Bartholomew's Church, and the Newport Country Club. On his death, family leadership passed to his brother, William Kissam Vanderbilt. His philanthropy had been such that he did not increase the wealth that had been left to him. Incorporated January 9, 1854, under the laws of Indiana. Consolidated with the Oswego and Indiana Plank Road Company of Illinois July 1, 1854. Operated under perpetual agreement, dated September 7, 1851, by which, as amended The Michigan Central Railroad Company maintains the road and pays a rental of $15,000 per annum, being five per cent. on the capital stock of $300,000 and interest on funded debt and all taxes and expenses, and receives all revenues. 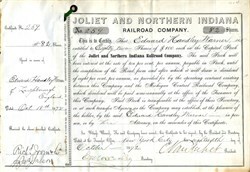 Bonds of The Michigan Central Railroad Company issued for $1,500,000 secured by a mortgage on the property of the Joliet and Northern Indiana Railroad Company (under which mortgage the issue of bonds of The Michigan Central Railroad Company to an amount not exceeding $3,000,000 is authorized), have been substituted for such funded debt. The Michigan Central Railroad Company owned the entire capital stock. "He had a real sense of his duties and responsibilities. He did not give himself up to moneygetting, nor to selfish enjoyment. He did not starve bis mind and soul to fatten his bank account; he was never the Dives of the parable. He gave generously of his time and personal energy as well of his money to the affairs of his church and the public charities of his city. He was a benefactor to education ; whether Yale and Columbia have even yet received their last from that liberal hand will not be known until the will is opened. Best of all, he tried to brighten and widen the lives of the men working for wages on the Vanderbilt roads. If he had done nothing but that, it would still be certain that when he died he did not leave all his treasure behind him." "Notwithstanding vast wealth, he was possessed of simple tastes and avoided ostentation. Unlike some other American millionaires, he did not hold this country in contempt." "It was very fortunate for Mr. Vanderbilt that he should not have grown up with the notion that he was to be a rich man, that he should have grown up with the notion that he had to earn his own living. For it is to this expectation and to the habits that are formed of it, that all the masculine virtues are due. Without this stimulus of necessity the majority of mankind would be pretty poor creatures. . . . Mr. Vanderbilt had this great advantage of 'bearing the yoke in his youth.' Possibly his character would have withstood the ordeal of a bringing-up as the heir apparent to many millions. At any rate, that ordeal was spared him. And at any rate, the resulting character was very fine. Until he was disabled by illness, no clerk, no brakeman, in his employ worked so hard as he. In his Newport palace there was a little plain office in which the master of millions wrestled with the cares he could not escape. No 'government' ever devised by man could have distributed his income with so conscientious and intelligent a care as he distributed it himself. His benevolence was not a matter of impulse, but of duty, and accordingly his great and numerous benefactions, made always after taking anxious counsel, ' are likely to last.' He has left behind him no more conscientious business man, no rich man more conscious of his stewardship, no better American citizen. And he takes with him to the grave the sorrowful respect of all who knew him." Cornelius Vanderbilt, the second child and eldest living son of the late William H. Vanderbilt, and grandson of "Commodore" Cornelius Vanderbilt. the founder of the family fortune, was born at New Dorp, S. I., November 27. 1843. His birthplace had been given to his father by his grandfather, at a time when the family was still in humble circumstances. After an academic education, at the age of eighteen, he entered the Shoe and Leather Bank of this city as a clerk. He then became connected with the banking house of Kissam Brothers. At the age of twenty-two, through the influence of his grandfather, the "Commodore." he was made assistant treasurer of the Harlem Railroad. He advanced to the position of vice-president of this road, and also of the New York Central. In 1883 he became chairman of the board of directors of the New York Central. Besides railroad matters, Mr. Vanderbilt was interested in religion, philanthropic art, and educational institutions and subjects. The range of his activities may be seen from a list of the business enterprises and benevolent projects with which he was connected at the time of his death. He was then president of the Canada Southern Railway, vice-president and director of the Beach Creek Railroad, president of the Detroit and Bay City Railroad, director of the Cleveland, Cincinnati, Chicago and St. Louis Railroad, director of the Detroit and Chicago Railroad, director of the Dunkirk, Allegheny Valley and Pittsburg Railroad, director of the Hudson River Bridge Company, president of the Joliet and Northern Indiana Railroad, president of the Leamington and St. Clair Railroad, president of the New York and Harlem Railroad, president of the Niagara River Bridge Company, president of the Spuyten Duyvil and Port Morris Railroad, director of the Wagner Palace Car Company, director of the West Shore Railroad, director of the West Shore and Ontario Terminal Company, director of the Toledo, Canada Southern and Detroit Railway Company, director of the New York Central and Hudson River Railroad, and a dozen other affiliated railroads. He was a vestryman of St. Bartholomew's Church, a member of the finance committee of the Protestant Episcopal Board of Foreign Missions, a member of the executive committee of the International Young Men's Christian Association, vice-president of the local Young Men's Christian Association, a trustee of the Seamen's Mission of the Protestant Episcopal Church, a trustee of the Hospital for the Relief of the Ruptured and Crippled, a trustee of the General Theological Seminary of the Protestant Episcopal Church, a trustee of the Bible Society, a trustee and chairman of the executive committee of St. Luke's Hospital, a trustee of the Society of St. Johnsland, a trustee of the Cathedral of St. John the Divine, a director of the Improved Dwelling Association, vice-president of the Eye and Ear Infirmary, a director of the Home for Incurables, a director of the College of Physicians and Surgeons, and a director of the Sloane Maternity Hospital. He was a trustee and chairman of the executive committee of the Metropolitan Museum of Art, a trustee of the Museum of Natural History, and a trustee of Columbia College. From: 'Parishes: Over Silton', A History of the County of York North Riding: Volume 2 (1923), pp. 51-55. URL: http://www.british-history.ac.uk/report.aspx?compid=64610 Date accessed: 12 February 2011. Partridge, Samuel Steads (b. 1839) — also known as S. S. Partridge — Born in England, June 22, 1839. Not U.S. citizen; solicitor; U.S. Consular Agent in Leicester, 1891-1911. Burial location unknown. Mr. Samuel Steads Partridge, of the firm of Haxby and Partridge, of Leicester, has been appointed a Commissioner to administer oaths in the Supreme Court of Judicature. Mr. Partridge was admitted in 1860.